The interior of the Safe Haven center are seen during a preview event for the facility. 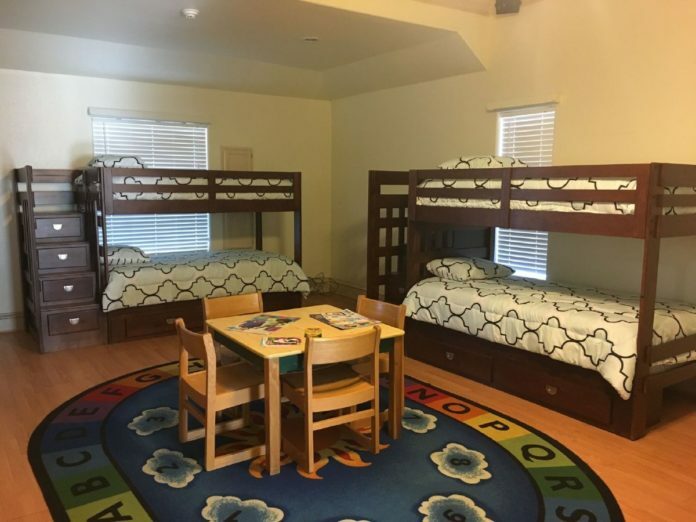 ALAMO — The first emergency shelter for children in Hidalgo County is preparing to open here in the fall, filling a gap in the services for abused children in the Rio Grande Valley. Safe Haven for Kids will provide a place to stay for children who have been removed from their home by Child Protective Services. The absence of a shelter like this one has required CPS to house the children in their offices or to take them to a shelter out of the Valley. The shelter will admit children up to the age of 10 and their stay will range from 48 hours to 45 days until CPS finds a more permanent placement for them, such as a foster home, a relative’s home or an institution. Though the need is great in the county, which reported 355 removals in 2016, Safe Haven will start off small with 16 beds. She said they’ll be looking for people who want to give back to their community but also would like to find people who have experience in the field of mental health. Garcia, herself, received a bachelor’s degree in social work in 2009 from then-University of Texas Pan-American and in 2012 began working at Helping Hands Home for Children, a residential treatment center for children in the foster care system located in Austin. But Garcia decided to move back to the Valley when she learned an emergency shelter would be opening here. Founder Angela Ridling said she wanted to open the shelter because of the need for it and because she wished to work with children again. Originally from Pharr, Ridling wanted to launch a program for young people while living in Poteet, a city just south of San Antonio. The program would have provided housing for teens who aged out of foster care system and would have offered vocational training or helped them get into college. Unfortunately, the funding for the program fell through and Ridling moved back to the Valley. To ensure the launch of the shelter was successful, Ridling said she surrounded herself with the right people, like Garcia, who have the proper training and skills. The state will pay $129.53 per child, per day but Ridling said that wasn’t enough. She said they’ve applied for grants and already received donations from Magic Valley Electric, Lacks Valley Stores and Ashley Furniture HomeStore. Safe Haven is currently still in the licensing process but Ridling said they hope to open in late September.